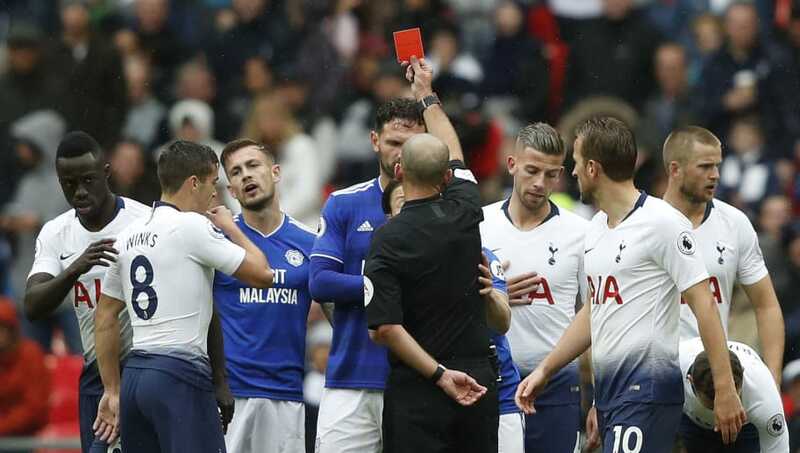 ​Cardiff have failed in their appeal against a straight red card shown to midfielder Joe Ralls in the 1-0 defeat to Tottenham on Saturday. Ralls was dismissed by referee Mike Dean in the 58th minute of the match at Wembley as he committed a serious foul on Lucas Moura after the ball had gone, incurring an automatic three-match ban. Cardiff unsuccessful in appeal against Joe Ralls red card vs Tottenham. The midfielder will miss Fulham, Liverpool and Leicester. Cardiff manager Neil Warnock ​described the decision as "very soft" and accused Spurs striker ​Harry Kane of attempting to get Ralls sent off by "trying to make an issue of it". The Bluebirds contested the red card, but their appeal was rejected by the Football Association. Ralls will now miss three Cardiff's next three Premier League matches against ​Fulham, ​Liverpool and ​Leicester after the international break. It was an optimistic appeal by ​Cardiff, seeing as Ralls made no attempt to play the ball. If anything, the Bluebirds are lucky that the FA no longer imposes additional bans for frivolous appeals. Eric Dier scored the only goal of the game in the first half as Cardiff suffered a fifth straight defeat to leave them rooted to the bottom of the Premier League table. Cardiff remain winless after eight matches with just two points on the board. They have scored just four goals, joint with Huddersfield for the fewest in the league.